Standing in the heart of Norfolk's undulating fields, the windmill now looks as it did over 100 years ago. At that time over 300 mills ground corn for horse and cattle feed and bread making in Norfolk. Now very few are left and Bircham Mill is considered one of the best still remaining - it is the only windmill in working order in the area open to the public. Many items of interest are on the ground floor for visitors to see. When possible on windy days the sails turn the milling machinery inside and visitors can climb the five floors up to the fan stage. The wonderful smell of freshly baked bread welcomes visitors to the bakery which is attached to the mill building, it supplied the area with bread made with flour ground at the windmill. The 200 year old coal fired oven is still here for you to see, and was capable of baking 100 loaves at once being 8ft wide and 12ft deep. People would walk miles to obtain their daily loaf. Many baking items are here for visitors to see. Fresh bread and rolls for sale (no bread on Saturdays). When the mill was built horses were the only form of transport and the miller and baker would deliver bread and flour by horse and cart. Ponies are still kept at the Mill, and there are lots of animals to see. The mill garden is a relaxing place to sit while the children play, or wander amongst the sheep, goat and hens in the paddock. There is also a stable room and wind power room with interactive displays. Diary sheep arrived at Bircham Windmill in 2009 and we are now milking a dozen sheep at 2pm every day and making all the milk into feta and Wenesleydale style cheeses. Viewing is free and cheese is on sale in the bakery. free entry to all areas except windmill museum. 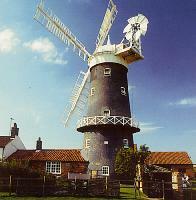 Bircham Mill is 6 miles from Sandringham and 8 miles from Hunstanton. Brown signs from Bircham village.